Is it happening to you? You wake up at night, look at the clock, and notice that it is 11:11 p.m. This happens again the next night, and the next. You think it is a coincidence, but what if you were to discover that it was happening to others—possibly millions of others—all over the world? And that it meant something...something important? The reports of people noticing strange and repeated associations with the number 11 are on the rise, prompting theories connecting this phenomenon with the coming Mayan calendar end date of 12/21/2012. But it’s not just the number 11 that is showing up in people’s lives, it is often accompanied by unusual events or profound insights. • Number-based patterns in nature—such as the Fibonacci spiral, the golden ratio, and DNA sequences—and the secrets of sacred geometry. • Synchronicity: The science behind coincidences and what they might be trying to tell us. • How the entire universe can be condensed into a handful of mathematical numbers and equations. • The power of numerology in human lives. • Is God a number? How numbers relate to the creative force behind all reality. 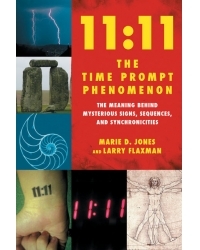 We live according to times, dates, and numbers, and 11:11 The Time Prompt Phenomenon will explore the mysteries of 11:11 and the many other ways in which numbers compose the very foundation of our reality. Marie D. Jones is the author of 2013: The End of Days or A New Beginning? and PSIence: How New Discoveries in Quantum Physics and New Science May Explain the Existence of Paranormal Phenomena. She also co-authored Supervolcano: The Catastrophic Event That Changed the Course of Human History and many other published books, articles, reviews, and essays. She is a licensed New Thought Minister and has an extensive background in metaphysics and the paranormal. Jones has appeared on Coast to Coast AM and many other popular radio shows around the world. She lives in San Marcos, California. Larry Flaxman is the founder and president of ARPAST (www.arpast.org), the Arkansas Paranormal and Anomalous Studies Team. He has been actively involved in paranormal research and investigation for more than 10 years and has authored many articles and been featured in numerous newspaper, magazine, radio, and television interviews. He lives in Little Rock, Arkansas.